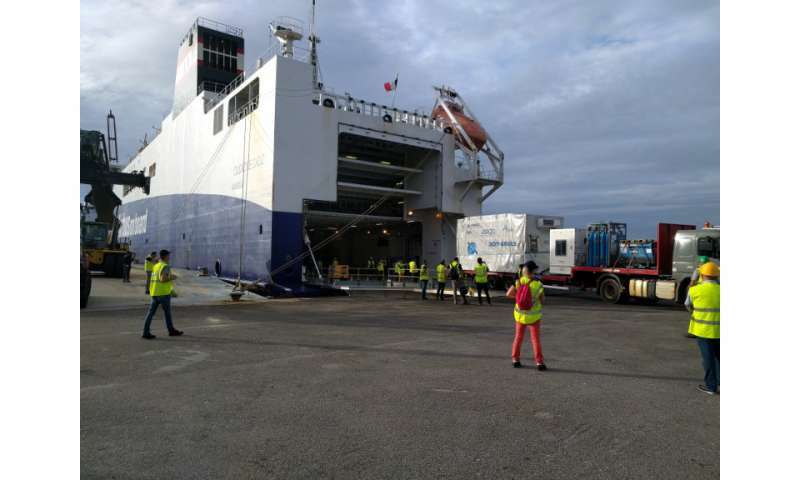 Having set sail from France on 15 June—Global Wind Day, ESA's Aeolus wind satellite has arrived safe and sound at the launch site in French Guiana. While almost all satellites travel by aircraft, Aeolus' journey was rather different – it travelled all the way across the Atlantic from Saint Nazare, western France to the Port of Cayenne, French Guiana by ship. Aeolus carries one of the most sophisticated instruments ever to be put into orbit. A 12-day journey was undertaken to avoid potential damage caused by air re-pressurisation during descent had the satellite travelled by air – a quicker but decidedly riskier option. Upon its long-awaited arrival, the team unloaded Aeolus and its support equipment. The containers were then carefully positioned on a truck to be transported to the launch site about 60 km away, where the satellite container was moved into the airlock, to stabilise after its long journey. The satellite was then removed from its container, placed on its integration trolley for testing and connected to its electrical support equipment. Initial checks indicate that Aeolus has withstood its journey from France in good condition. ESA's Aeolus project manager, Anders Elfving, said, "We are obviously all extremely pleased that Aeolus has now arrived at the launch site. An awful lot of work and planning went into making sure it arrived safe and sound – now it's full steam ahead for preparing the satellite for liftoff on 21 August." 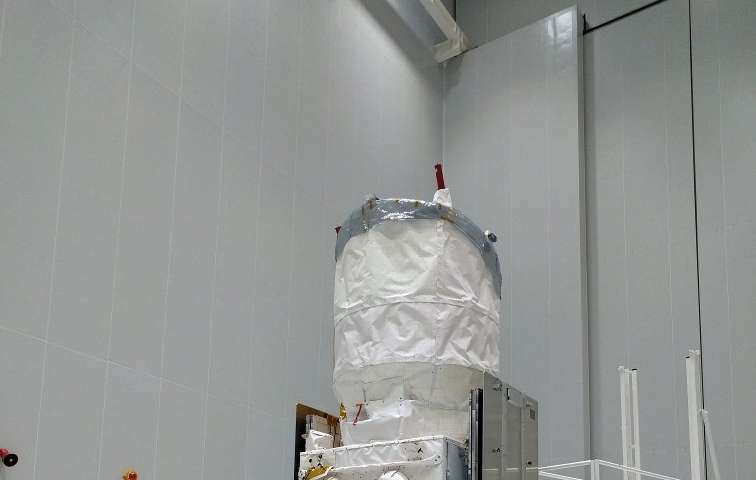 A range of checks will be carried out on the satellite in the cleanroom before the scheduled liftoff on a Vega rocket on 21 August at 21:20 GMT (23:20 CEST) from Europe's spaceport near Kourou. 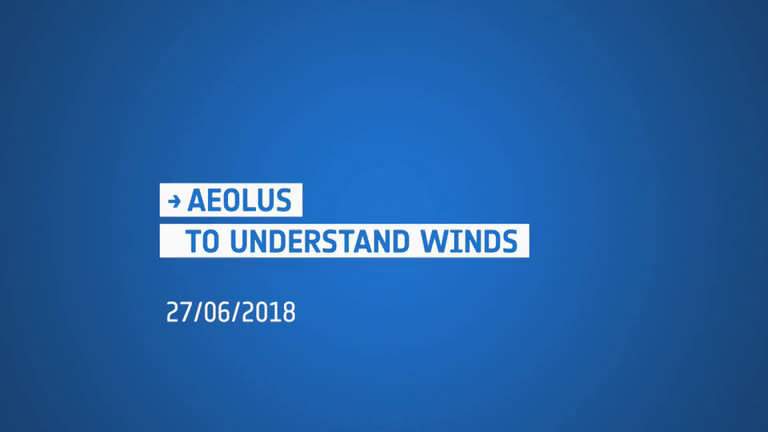 ESA's Aeolus mission scientist, Anne Grete Straume, added, "We expect Aeolus to advance science, whilst at the same time having a range of potential practical application areas by improving forecasts, which is of importance to the wind energy industry, for example. Accurate forecasts are just one of the ways in which our mission will be able to help."